On a wintry, bright but cold morning, Barbara and John Schofield led 12 Amblers to Merrivale to see the stone rows. 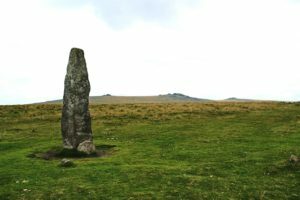 The main area of archaeological interest is to the south-east of Merrivale and although it has been diminished over time, the site includes a 3.8m standing stone, a stone circle and a stone row. Also visible are two stone avenues running parallel to each other on either side of a stream. The southern avenue over 260 metres long and has the remains of a barrow in the middle. The northern avenue is slightly shorter. Both avenues are only about 1 metre wide down the centre. The southernmost double row has a kistvaen set within the stone row. The eastern end of the rows is passed by a section of the Great Western Reave, running roughly NW-SE. 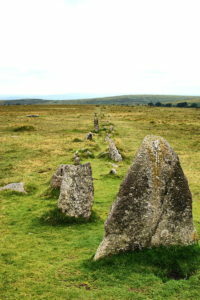 It is the quantity of stones that is so striking, reminiscent of the French collection at Carnac although Merrivale is on a less grandiose scale. There are two possible interpretations: either this jumble is a ritual assemblage, as archaeologists tend to assume, or they are industrial scrag ends. Consider, for instance, how close you are to the quarry and how level the site is compared to the surrounding terrain. Has it been specially levelled and, if so, for ritual purposes or to allow a pony and loading-sledge easy access? 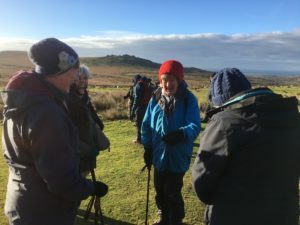 Whatever the answer, the Amblers accompanied by a very energetic spaniel, enjoyed the walk in mainly sun and blue skies in a lovely part of Dartmoor.